A new movie about the nation’s winningest high school football team gets high marks for connecting the playing field to life, showing how excelling in one arena serves as a preparation to succeeding in the other. 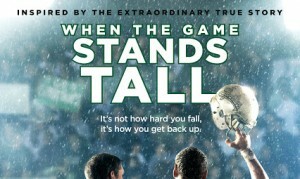 When the Game Stands Tall is a movie that doesn’t resort to pat theatrics or goal-line heroics to deliver its message that the individual must give his all for the team, honest effort is more important than victory, and the true character of a winner is found in how he responds to loss. In developing these themes, the movie is true to the character of real-life coach, Bob Ladouceur, who led Catholic De La Salle High School of Concord, Calif., to an incredible 151-game winning streak over 12 seasons. It is recognized as the longest winning streak in the history of organized sports. An educator at heart, “Coach Lad” saw his job as molding teens into young men of virtue and character more than sustaining the glory of a winning streak. As he said in a recent Fathers for Good interview, “The goal was to play well from week to week and let everything else fall into place. The streak carried its own momentum.” Indicative of his attitude is the fact that he retired last year with 399 career wins, declining to start another season just to notch an even 400. Ladouceur, 60, who still works for the school, is played by James Caviezel, best known for his role of Jesus in the movie The Passion of the Christ. A calm, determined and always focused presence throughout the movie, Caviezel avoids the dramatic locker-room antics that mark other popular sports films. Playing a character who taught high school religion for three decades, he casts himself in a Catholic mold, motivating his young players through emotion but mostly through the intellect and will. He sets the goal and shows the way, leaving it to the boys to develop the desire and the strength to get there. 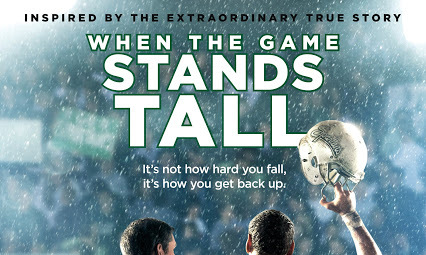 Based on a book by the same name, When the Game Stands Tall gets inside the minds and hearts of the coach and his young players. Coach Lad is a father figure to some, an iconic presence to others and a mentor to all. Loving and low-key off the field, he’s direct and demanding when driving the boys to give their all (and a little bit more) each day and every play. We don’t expect a perfect game because people make mistakes, he says in a locker room oration, but we do expect you to give a perfect effort on each play. The look on the boys’ faces as they digest the meaning of these words tells the whole story of the movie: there’s no easy road to the good and virtuous life; love is linked to responsibility, mercy to the demands of law. Those who embrace the challenge mature into young men standing tall in the finest Catholic tradition.